Leave it like it is! Looks like we’re determined to damage the Grand Canyon. The above picture was from a backpacking trip two winters ago. Our views across the canyon were unimpeded by the development of hotels or other tourist structures. 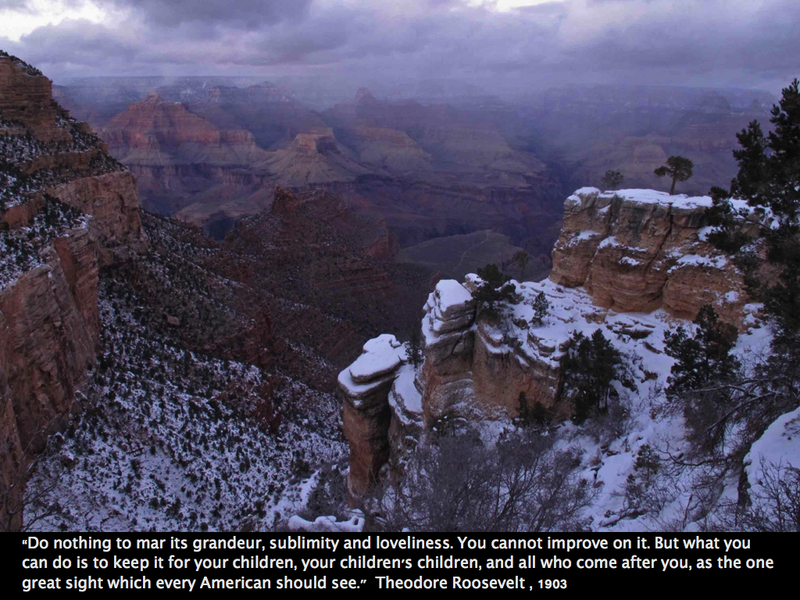 We’ve seen enough development around the Grand Canyon. Present levels of development allow people to enjoy the views safely. I hope the proposed additional development will not go forward. This entry was tagged Grand Canyon, Grand Canyon development, Theodore Roosevelt. Bookmark the permalink. It must twist your heart to ponder this possibility. i think about the light pollution that would also alter a camper’s glimpse of a carl-sagan sky – ha, especially during a meteor shower. i agree. leave it like it is.